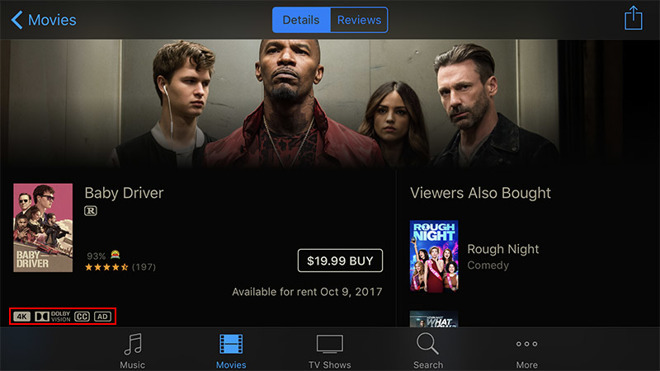 As promised, Apple on Thursday began rolling out 4K HDR movies on its iTunes Store, content that customers will be able to stream using the company's new Apple TV 4K set-top box come next week. Apple began the process late in the day, and only certain titles are currently offered with 4K HDR support. It seems the company is rolling out availability by region, starting with the U.S.
Movies, TV shows and other video properties benefitting from 4K HDR will show up with special icons. For example, in the screenshot above, "Baby Driver" carries designations for "4K" and "Dolby Vision," the latter being a popular HDR protocol. Not all movies that are expected to support 4K HDR playback are showing the special labels. Further, notification of support is not yet system wide, as some movies display "4K" and "Dolby Vision" icons on iOS, but lack those assets on macOS. With Apple TV 4K going up for preorder in a few hours, and shipments set to arrive on Sept. 22, Apple still has a week to build out its 4K HDR content library. Once the 4K set-top streamer is in customer hands, the company should have a healthy stable of titles ready for rental or purchase. Notably, Apple reached agreements with major Hollywood studios that will allow the company to offer 4K movies at the same cost as 1080p HD versions. In addition, customers will be treated to free 4K HDR upgrades of previous HD purchases. The process is automatic, meaning users can simply start streaming previously purchased shows in the highest resolution available. Apple announced Apple TV 4K at a special event on Tuesday. Powered by an A10X Fusion system-on-chip, the box is capable of outputting video at a resolution of 3,840-by-2,160 pixels and comes with support for a number of HDR standards. The Apple TV 4K goes on sale at 12:01 a.m. Pacific. A 32-gigabyte model is priced at $179, while the 64GB version comes in at $199.